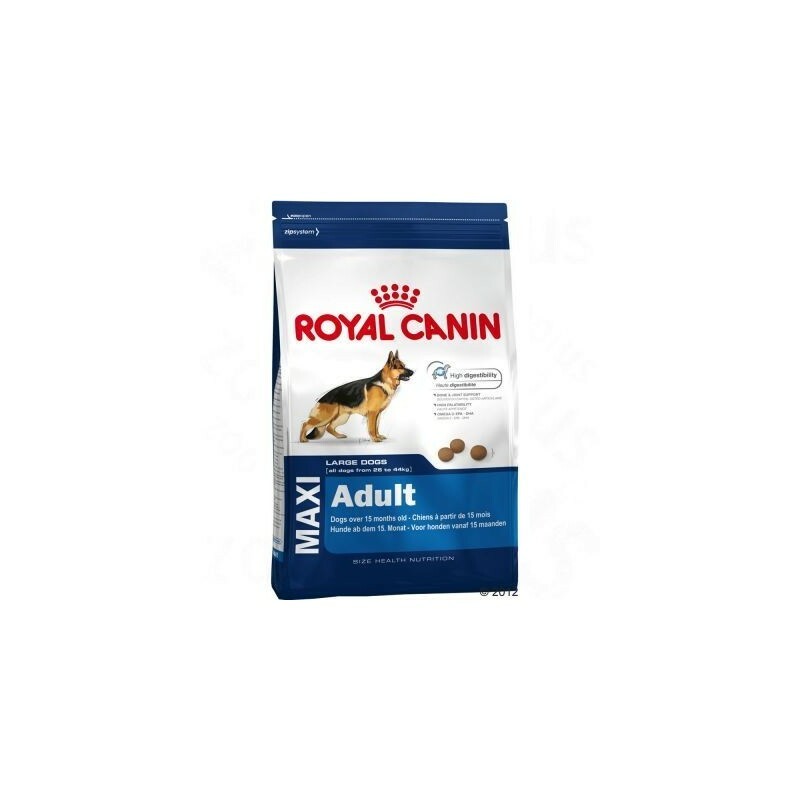 Royal Canin Maxi Adult 15 kg is a dry food completely balanced for dogs of large breeds, from 5 years of age. It provides all the nutrients necessary to keep the animal in perfect physical condition, controlling your weight and providing vitality and beauty to the fur. 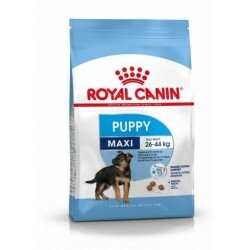 Royal Canin Maxi Adult is a food for dogs from 26 to 44 kg from 15 months to 5 years; that will help your pet to maintain optimal weight and an optimal state of health, covering the specific needs of your big dog. The large breed dogs like yours need to follow some special guidelines in your diet because they suffer from the effects delenvejecimiento early, as tenderness in the joints, heart problems, and digestive disorders. Ingredients highly digestible to ensure maximum amount of nutrients. A contribution moderate in fermentable fibers that feed the bacterial flora. A contribution in fibers, non-fermentable that improve the transit. Chondroitin, glucosamine and fatty acids of the series omega-3 that contribute to the maintenance of joint health. Taurine that promotes the proper functioning of the heart. The polyphosphate of sodium, limits the formation of tartar. In addition to this food for big dogs, presented in the form of pellets, will satisfy the appetite of your pet, thanks to its careful selection of natural scents. Promotes the proper functioning of the heart. Taurine stimulates the contraction of the heart. Maintains joint health. The contribution of chondroitin, glucosamine and Omega 3 fatty acids. Nourishes the bacterial flora. With its moderate dose of fermentable fibers. Limits the formation of tartar. The polyphosphate of sodium acts quelando the calcium salivary. Care of digestion with its ingredients highly digestible (meat of dehydrated poultry, gluten from corn, dried egg) ensure a maximum contribution of nutrients. Maintenance of the bacterial flora and reducing flatulence. A contribution moderate in fermentable fibers allows you to limit the fermentation activity and nourish the bacterial flora. Improvement of intestinal transit. A contribution in fibers, non-fermentable, it allows to improve the transit and the consistency of the stool. Joint health. The contribution of chondroitin, glucosamine and fatty acids of the series omega 3 (EPA/DHA) contributes to maintenance of joint health. Heart health. Promotes the proper functioning of the heart thanks to the inclusion of taurine that stimulates heart contraction. Dental health. The polyphosphate of sodium, present on the surface of the croquette, acts quelando the calcium in saliva and limiting the formation of tartar. It is a feed for dogs with high palatability. You will love their flavor with natural aromas and textures designed for your size. 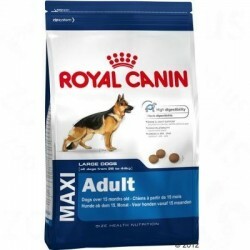 Food for adult dogs of large breeds between 26 and 44 kg with an age of 15 months to 5 years. Ingredients: dehydrated poultry proteins, corn, corn flour, animal fats, wheat, rice, maize gluten, hydrolysed animal proteins, beet pulp, fish oil, soya oil, minerals, yeasts, hydrolysed of crustacean (source of glucosamine), hydrolysed cartilage (source of chondroitin). Additives (per kg): nutritional Additives: Vitamin A 15500 IU, Vitamin D3: 1000 IU, E1 (Iron): 43 mg, E2 (Iodine): 4.3 mg, E4 (Copper): 13 mg, E5 (Manganese): 56 mg, E6 (Zinc): 168 mg, E8 (Selenium): 0.08 mg - technological Additives: Clinoptilolite of sedimentary origin: 5 g - Preservatives - Antioxidants. Analytical components: crude Protein (26%) - Oils and fats gross 17%) - crude Ash (6.6 per cent) - crude Fibre (1,3%) - Per kg: omega 3 fatty Acids: the 7.8 g including EPA and DHA: 4 g.